Why Alencon was chosen by Colbert in the 17th century ? 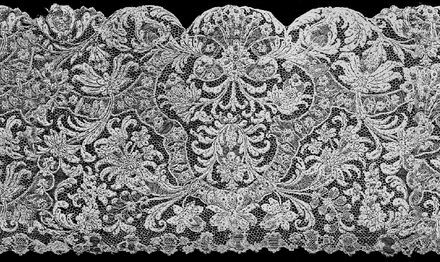 Colbert's attention was directed to the immense amount of money that was sent out of the kingdom ; Alencon, in Normandy, was chosen as one of the seats of the new manufacture, because the lace industry was already widespread among the peasants. Point coupe had been made there at an early date, possibly introduced by Catherine de Medicis, to whom Charles IX had given the Duchy of Alencon. About 1650, according to Madame Despierres, it appears from a letter of Favier-Duboulay, intendant of Alencon, that points de Venise were successfully imitated and introduced into Alencon by "une femme nommee La Perriere, fort habile a ces ouvrages,"* thus causing the gradual disappearance of point coupe. 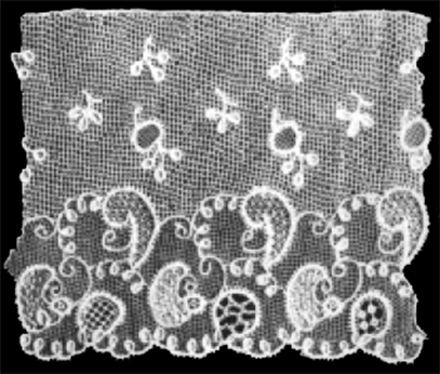 More than eight thousand persons were employed in lace-making in Alencon, Seez, Argentan, Falaise, and in the neighbouring parishes.It is no doubt to this long apprenticeship in lace-making that the supremacy of Alencon among French laces is due. An ordinance of 15th August 1665 founded the manufacture of points de France, with an exclusive privilege for ten years ; a company was formed, and the manufacture realised enormous profits until 1675, when the monopoly expired and was not renewed. The new manufactures had the advantage of high-handed protection on the part of the Government. On 17th November 1667 appears a fresh prohibition of the selling or wearing of passements, lace, and other works in thread of Venice, Genoa, and other foreign countries ; and on 17th March 1668 iteratives —prohibitions—to wear these, as injurious to a manufacture of point which gives subsistence to a number of persons in this kingdom. In 1670 an Englishman travelling in France notices the efforts of the French Government to protect the points de France. " They are so set (he writes) in this country upon maintaining their own manufactures, that only two days ago there was publicly burnt by the hangman a hundred thousand crowns worth of point de Venise, Flanders lace, and other foreign commodities that are forbid." After the expiration of the privilege (1675) the "fabricants" had designs specially made for them, which became their exclusive pro­perty. In 1680 they asked and obtained permission to prosecute certain small manufacturers who copied their patterns,* and in 1691 they speak of the "licence" of several manufacturers, who copy the designs of others instead of using " tout leur esprit et tout leur Industrie ;'» inventer de nouveaux dessins et des modeles plus parfaits et plus delicats." It was in 1675 that the name of point de France began to be confined to point d'AIencon, no doubt as the most important of the French fabrics. Le Point d'AIencon is worked with a very fine needle, upon a parchment pattern. The parchment was originally used in its natural colour, but before 1769 green parchment had been adopted, as it is mentioned in an inventory of that date.T The worker is better able to detect any faults in her work upon a coloured ground than upon white. The paper pattern is laid upon the strip of parchment, which rests on a pillow, and the outlines of the ornament are pricked with a needle. After pricking, the parchment is given to a traceuse, who first sews it to a piece of very coarse linen folded double, then forms the outline of the pattern by two threads * which are guided along the edge by the thumb of the left hand, and fixed by minute stitches passed with another needle and thread through the holes of the parchment. The "picage" and the "trace" date in Alencon from the first imitation of points de Venise. The next process, the making of the "fond" or "entoilage,"f employs exactly the same stitch which was used for the mat of point coupe and for the "flowers" of point de Venise. The worker works the button-hole stitch (point boucle or de boutonniere, not, as is stated in so many authors, point noue) from left to right, and when arrived at the end of the row, the thread is thrown back to the point of departure, and she works again from left to right over the thread. Occasionally small pin-holes (portes) or a diaper pattern of pin-holes (quadrilles) were let into the fond. A more open variety of the fond is the rempli, formed by twisting the thread before making the loop, and these two processes were at first executed by the same worker. The brides of Alencon are of three sorts: the bride a picots, the bride bouclee, and the bride tortillee. The first—the bride a picots— had, in later point de Venise, shown a tendency to approximate to a regular, generally hexagonal, mesh. These brides in Alenqon were not marked upon the parchment until the reign of Louis XVI., and were made at sight, and towards the middle of the reign of Louis XIV. 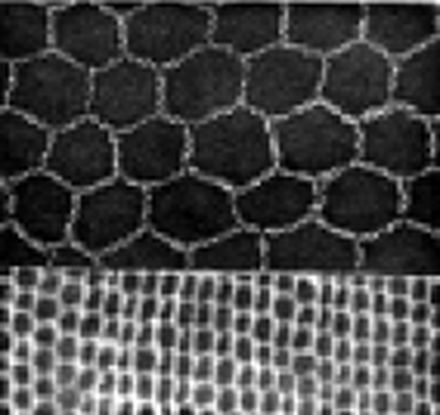 the meshes show an exact hexagonal form. It will be icmembered that in 1673 the "nouveau point de Paris" is described in the Mercure as covered with "an infinite number of small picots." The bride bouclee sans nez, also an hexagonal mesh, has no picots, ,ind was invented about 1700. In the bride tortillee the mesh is 11 ivered with a thread twisted round it, and held in place by a buttonhole stitch at each angle. * The reseau is worked from left to right, au point boucle et tortille, with the thread attached to the outline of the flowers and ornaments.t It began to be made at Alencon about 1700, as Madame Despierres proves from various inventories, and not as Mrs Palliser and M. Seguin assert, in 1741 at the earliest. The modes are made, like reticella, upon skeleton foundations of thread, which are afterwards covered with button-hole stitches, and were introduced, when the n'seau was used, to give an open and clear effect to certain portions of the design. The first modes were varieties of the brides a picots and zigzag bars picoted (Les Venises).